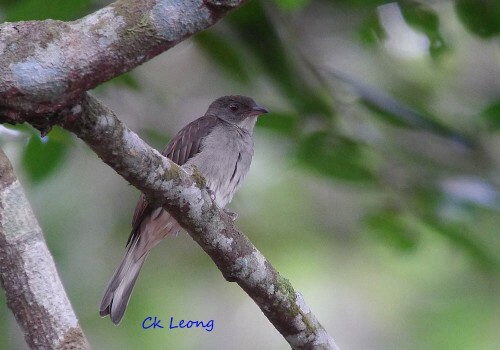 The Malaysian Honeyguide Indicator archipelagicus is a scarce bird of the lowland dipterocarp forest of South-east Asia. The male has a tendency to stay in the same area for extended periods where it announces its presence with its most extraordinary calls. Each call starts with a miau note followed by a long mechanical sounding rattle. This is repeated over long periods. The scarcity of the bird has it classified as near-threatened. Due to its strong territorial habits, please do not use playback for this bird.